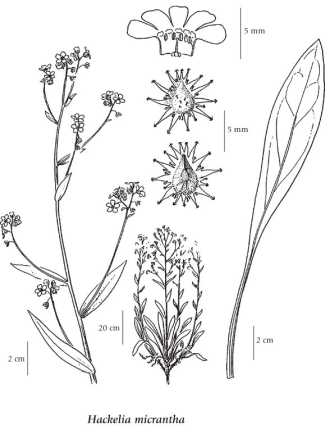 Perennial herb from a taproot and branching base; stems several to numerous, relatively sparsely hairy with coarse, stiff-spreading and (especially upward) short, appressed, straight hairs, 0.3-1 m tall. Basal leaves usually well-developed, persistent, oblanceolate or narrowly elliptic, stalked, 6-35 cm long and to 4 cm wide; stem leaves also well-developed, 5-20 cm long, 7-20 mm wide, the lower oblanceolate and stalked, the upper narrowly elliptic to oblong and unstalked, reduced upward, short appressed-hairy or coarsely stiff-hairy, entire, alternate. 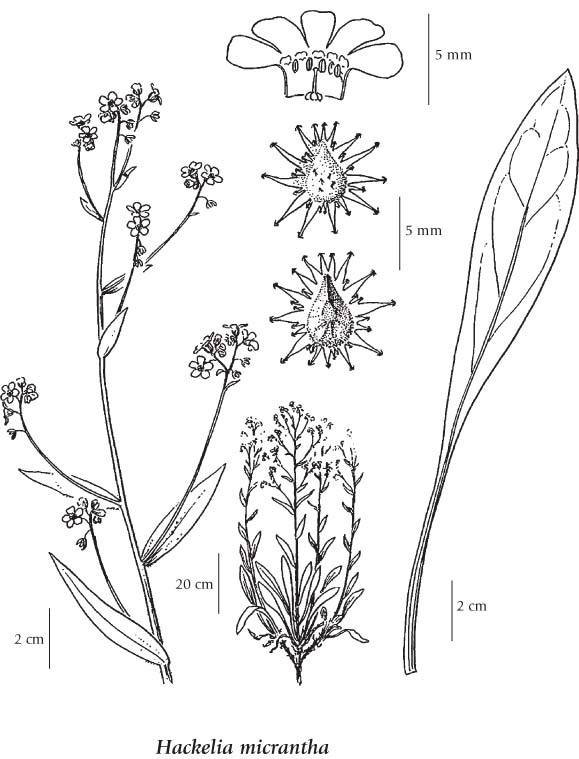 Inflorescence of several clusters with leafy bracts at the base, tending to be shorter, wider, and looser than that of H. floribunda; petals blue, fused at base into a short, narrow tube that spreads (5-11 mm wide) abruptly at top to 5 lobes, with 5 minutely pimply, yellow or whitish bulges. Nutlets 4, with marginal, barb-tipped prickles mostly distinct to the base, facial prickles several (usually 4-10), much shorter than marginal. 1. Flowers 4-20 mm wide, biennials or perennials. 3. Nutlets with central (facial) prickles in addtion to marginal ones. Dry to mesic rocky slopes, grasslands, shrublands and forest openings in the lowland, steppe and montane zones; frequent in C and S BC east of the Coast-Cascade Mountains; E to AB and S to UT and CA.